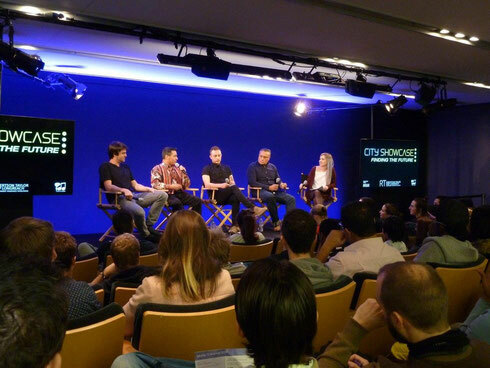 City Showcase: Finding The Future 2015, the free music seminar encouraging enterprise, entrepreneurs and employability in the music and entertainment industries, will be held at the Apple Store, Covent Garden, London WC2 from Wednesday 18 to Friday 20 November 2015 from 1-30pm to 7-30pm each day. Following its launch last year, the event provides a platform for leading industry executives to advise, share ideas and network with small companies, entrepreneurs, graduates, students and jobseekers. Attendees will be able to see hotly anticipated new artists, hear about employment opportunities and the latest developments in the creation, marketing and sale of music, and speak with highly successful executives from the entertainment world. Finding The Future features panels and presentations including wide-ranging topics such as careers in digital and new media, artist relations and events, reaching the modern consumer, the international music market, artist management and entrepreneurship, music publishing, and songwriting. Key executives already lined up to chair, moderate and speak at panels include moderators, William Booth from Sony/ATV, Andrew Cardew from Absolute, Ben Jones from the Musicians Union, Andy Ellis from the PRS For Music, James Hanley from Music Week, Chris Cooke from CMU, Roxanne de Bastion from the FAC, Morna Cook from Universal Music, Liz Stokes from Record of the Day and acclaimed writers from BASCA Tim Fraser and Simon Darlow. This year’s speakers include Gideon Mountford from Believe Digital, Ben Bodie from Ministry of Sound, Caryn Tomlinson from Universal Music International, Angie Jenkison from Teenage Cancer Trust, Josh Brandon from the Insanity Group, Neil Simpson from ATC, Janice Brook of Sony/ATV and many more. There will also be interviews with industry veterans including Daniel Miller from Mute Records interviewed by Alison Wenham from AIM, Henry Semmence from Absolute interviewed by Chris Cooke from CMU, and Robomagic founder Rob Hallett interviewed by James Hanley from Music Week. UK Music Chief Executive Jo Dipple will give a key note presentation providing an insight into the key issues and challenges facing the UK music industry as we head towards 2016. There will be daily ‘Meet The Future’ sessions with heavily tipped new acts between 7 and 7-30pm with publishers, managers and labels presenting their new writers/artists who will perform and answer questions led by the PRS for Music, The PRS For Music Foundation and PPL. Last year’s ‘Meet The Future’ featured Island Records new signing Nick Brewer, whose new single ‘Talk To Me’ Featuring Bibi Bourelly is being supported by BBC Radio 1.